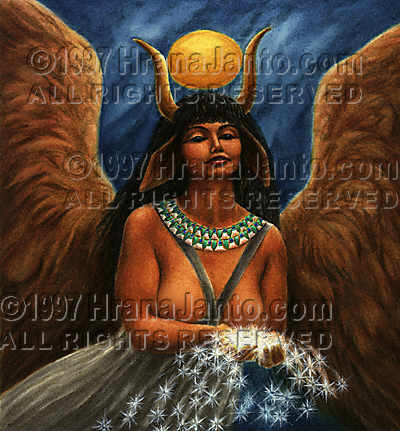 I painted Hathor in 1996 for the Goddess Oracle. One of the world's greatest goddesses, Hathor was worshiped for more than a millennium longer than the life, to date, of Christianity. For more than 3,000 years her joyful religion held sway over Egypt. Small wonder, then, that a profusion of legends surrounded her, or that she was depicted in so many different guises: at once mother and daughter of the sun, both a lioness and a cow, sometimes a woman, and sometimes a tree. One of the world's greatest goddesses, Hathor was worshiped for more than a millennium longer than the life, to date, of Christianity. For more than 3,000 years her joyful religion held sway over Egypt. One of Hathor's most familiar forms was the winged cow of creation who gavebirth to the universe. Because she bore them, she owned the bodies of the dead; thus she was queen of the underworld. Again, she appeared as the seven (or nine) Hathors who materialized at a child's birth and foretold its inescapable destiny. Then too, she was the special guardian spirit of all women and all female animals. Her festivals were carnivals of intoxication, especially that held at Dendera on New Year's Day, when Hathor's image was brought forth from her temple to catch the rays of the newborn sun, whereupon revels broke out and throbbed through the streets. (In this capacity she was called Tanetu.) She was a most beloved goddess to her people, and they held fast to her pleasureful rites long into historical times.